Pam is a black silver torbie with white. This is a relatively rare color and we are just thrilled. Pam is out of Dane and Penny. 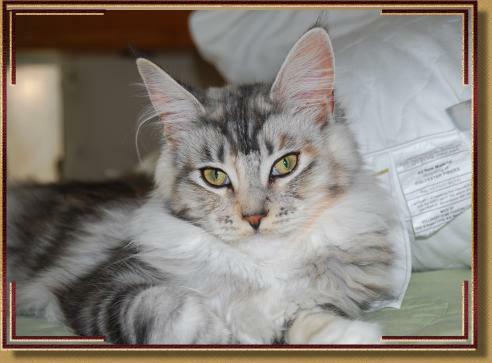 She is just a beauty and we are excited to see what color and type of kittens she will produce for us. She has an exceptional personality and she will always have a purr or a head bump for you. She loves to make biscuits on your lap and then pass out next to you. Today Pam live in san mateo with her new mom Margarett Anne, and they are the best of friends. Truly a match made in heaven.